This photo was taken on New Year's Day afternoon. 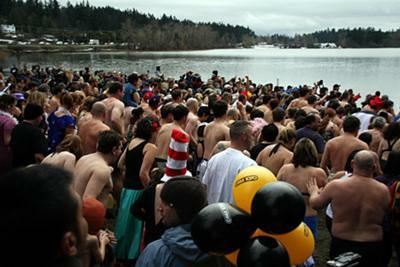 It was the 33rd Annual Polar Bear Swim at Elk Lake in Victoria, British Columbia. It was our 3rd time to join the madness. There were a number of people who came in costume but the honorary polar bear award was given to a guy in banana costume. It was the coldest one yet (3°C), according to the organizers. Despite the frigid water, there were still hundreds of people who showed up and took the plunge. Most of us just ran into the water, did the obligatory dip and ran as fast as we could back to the shore to get changed. There were a few brave souls who stayed in the water as long as 20 minutes. It was cold but it was also a lot of fun. We are definitely doing it again next year.